Photo Credit: Hassan Ould Moctar. 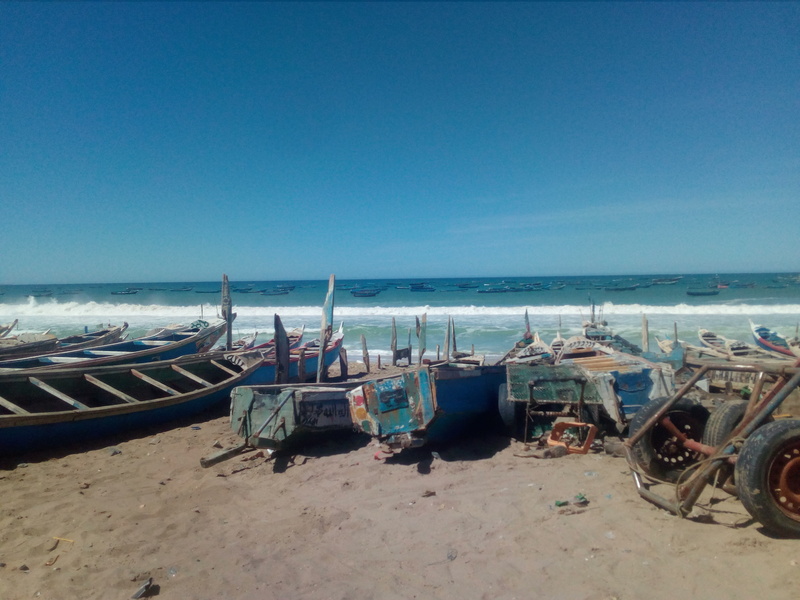 This post is written by Hassan Ould Moctar, Doctoral Researcher and Graduate Teaching Assistant in the Department of Development Studies at SOAS. One evening while sitting in a café in the northern Mauritanian port city of Nouadhibou, I was unexpectedly joined by a member of the Spanish Guardia Civil and a companion of his. I was on a research trip to Nouadhibou and had been introduced to the Guardia Civil officer earlier that week during the course of fieldwork investigations. His companion was a language teacher who worked in a private language school in the city. He also happened to be a migrant of West African origin. The officer was in need of language training, he explained, and the two had come to a private tuition arrangement. They had just finished a lesson and decided to drop by for a coffee. In the café, my companions sat down to join me. The conversation soon turned toward the situation of migrants in the city. When he first arrived, the language teacher worked in a fish processing factory. He said it’s been a lot better here since he found work at the language centre, but that things were still difficult. He had no contract and was worried about what would happen if at any point the school didn’t pay him. He couldn’t go to the police because he didn’t have a residence permit, and was therefore worried they would deport him. He said it’s impossible to get the residence permit: “You pay, and you’ll get a receipt, but you’ll never get the permit. Everyone knows this. Everyone knows you won’t get the permit, so why pay?” “You see,” the officer said to me, “that’s the reality.” In his ethnographic analysis of the European border regime in West Africa, Ruben Andersson discusses the ‘hunter and prey’ relationship between security forces and undocumented migrants in the region created by this regime.2 Yet, here both sat across from me, hunter and prey discussing the bind in which migrants in Nouadhibou find themselves. This vacillation between asserting an iron-clad duty and acknowledging the chasm between law and reality may be thought out with further reference to Andersson’s work. In his view, the vast technological and financial apparatus that is the European border regime in West Africa is ultimately characterised by absurdity, in the sense of that which is void of purpose. Not only does this regime produce the very illegal immigration it purports to prevent; the policy binaries it instills in its various protagonists also inevitably become unravelled in the messy process of lived subjectivity. I never did find out whether this process of unravelling yielded any transformative effects in this particular relationship. In any case, the ‘absurd’ structural facts – the substantive barriers to legal status faced by migrants in Mauritania, on the one hand, and the mandate of those tasked with patrolling illegal immigration on the other – seem unlikely to change in the near future. In the café, our conversation eventually turned to their lessons, and the difficulties one often encounters in picking up a new language. On this terrain, at least, the ‘hunter and prey’ dynamic was temporarily altered. “You’ll get there eventually”, the West African migrant assured the Guardia Civil officer.